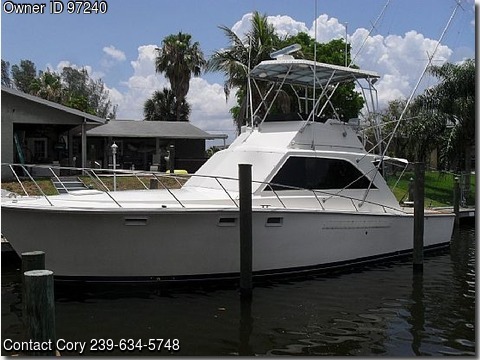 Please contact the owner directly @ 239-634-5748 or corykcooper@hotmail.com…BUILT BY THE MAKERS OF VIKING. Completely reworked and customized from pulpit to stern! The 1974/2005 Pacemaker 40ft Sportfish with twin Detroit 6/71n’s with 600hrs SMOH’s, 16kt cruise, 20kt full throttle. Only burns 20gph at cruise speed and sips fuel at 10kt, she will run 100 miles on 50 gallons with the generator. Fully operational lower station and bridge station, something you won’t find in any newer Sportfish Yacht. 2006 Yanmar MASE enclosed diesel 7.6kw Generator w/1500hrs with sound enclosure and external muffler for almost silent operation. She boasts two staterooms, with three cruisair a/c heating units, replaced last year. A beautiful and spacious salon with galley up and a Princess 3 burner stove oven and built in rotissorie. Raritan head with new macerator, custom fiberglass cockpit with huge 60″x30″ flip open hatches for below deck iceboxes and access, bait freezer,brand new solid fiberglass and gel coat custom bait station and 40 gallon live well, no paint on boat, top cap and bridge gel coated in 2010. Flat screen, surround sound, DVD, CD, all new port lights in June 2012, Temperpedic mattresses throughout, sleeps five comfortably, All new tempered and safety glass, new 1/4 inch certified, grounded and baffles built into aluminum fuel tanks,350 gallon capacity, all new carpet, headliner and aerospace salon sound down insulatoion, new refrigerators and freezers, Simrad autopilot(new computer(6-11) Furuno 48m mile open array radar, Garmin 2010c Gps Chartplotter, fishfinder, ICOM VHF’, two 5″Ritchie Compasses, new Michigan Nibril props and shafts in 08 ($8000.00), all new 600 year old geourgous Burmese teak installed 12/11, Lee double spreader outriggers, 1974 Large Murray Tuna fighting chair. 150 watt metal halide underwater lights. Top replaced by Scotty’s 12/11, Bottom done and all rigging in October 2011. Boat is presently lift kept. All Mahogany interior is original and restored! Entire bulkhead replaced in 05 and 06, have pictures and reciepts of all work performed. New enclosure, three new 2000 gph Rule bilge pumps and floats. All new batteries in October 2012. this boat is a true classic Sportfish with a one inch thick hand laid hull, no blisters ever. 43 1/2 ft Overall with 14 ft beam, 2.8 ft draft. Privately owned and never chartered. If you spend less it will cost you more. Own the only one in the world GULFZILLA.